Karsh’s Catering, Bar and Eatery has been associated with fresh food, quality service and exceptional professionalism since 1998. We provide catering services to a wide range of customers—including for corporate events and luncheons—with a diverse menu that can be customized to meet your needs. No event is too big or too small, and we’re always ready to work with you to make your event a success. 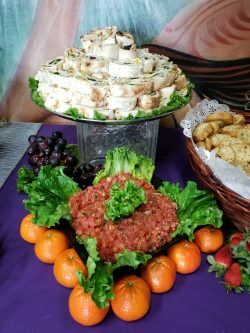 Though Karsh’s Catering, Bar and Eatery has been a top choice for catering in Fresno, CA since 1998, our reputation for excellence goes back even further. In 1954, Grandpa Joe and Grandma Rose opened Karsh’s bakery, on Van Ness in downtown Fresno, CA. Soon after, their son Norman Karsh entered the business to continue providing local residents with fresh-baked goods. Today, we’ve become a third-generation business and evolved into a catering company, run by award-winning Executive Chef Andrew Karsh. We still use fresh ingredients and strive for top-level customer service, and we’re driven to ensure anyone eating our food enjoys it to the fullest. From corporate events to birthdays, anniversaries to wedding catering in Fresno, CA, we want to be part of your next event! No matter if you’re expecting 50 or 500 people, our team is ready to spring into action, cooking and serving food on-site for the freshest meal options possible. Choose from BBQ-themed entrées or a cold sandwich spread, luxurious appetizers or a tremendous salad bar—whatever your guests have a taste for, we’ll make it to perfection. We even take care of the presentation, decoration, serving and setup, so you can focus on enjoying your event. Call us the next time you’re planning an event—we promise you won’t look anywhere else for catering services in the future! We customize menus for your specific event, to ensure your guests get the best food possible. We serve the entire Fresno, CA area and can travel up to 100 miles to cater your event. We specialize in corporate catering and can provide food for any formal event, as well as box lunches or luncheon catering. There’s no event too big or too small for us to cater and we’re ready to work with you to determine how much food is ideal for all your guests. If it’s not on one of our menus or if you have a special food request, we can make it! From a small family reunion to the biggest corporate party, trust Karsh’s Catering, Bar and Eatery to feed your guests! Contact us today to customize your menu and get pricing on superior catering services.